Revive those sweet memories of summer with this root beer float layered treat. Root beer flavored dark chocolate brownies are topped with a rich cream cheese vanilla “ice cream” layer that is topped with chocolate ganache. It’s the perfect way to say goodbye to summer. Preheat oven to 350˚ F. Line a 9-inch square metal pan with foil and butter the foil. Using a double boiler, melt the butter, unsweetened chocolate, and chocolate together until the mixture is melted and smooth. Add the granulated sugar to the melted chocolate mixture and combine; set aside. In another bowl, whisk together the brown sugar with the eggs then whisk in the root beer extract. Slowly temper the chocolate gradually into the egg mixture until well combined. In another bowl, whisk together the flour, salt, and baking powder. Fold in flour mixture into the chocolate mixture until smooth and well combined. The batter should be glossy and shiny. Scrape the brownie batter into the pan and smooth the top. Set aside while you make the cream cheese filling. Using an electric mixer, beat the cream cheese, flour, salt, and cream together for 5 minutes. Make sure the mixture is very smooth and fluffy with no lumps. Add the sugar and continue beating until very smooth. Add the extract and beat until well combined. Add the egg and mix until the egg is fully incorporated. 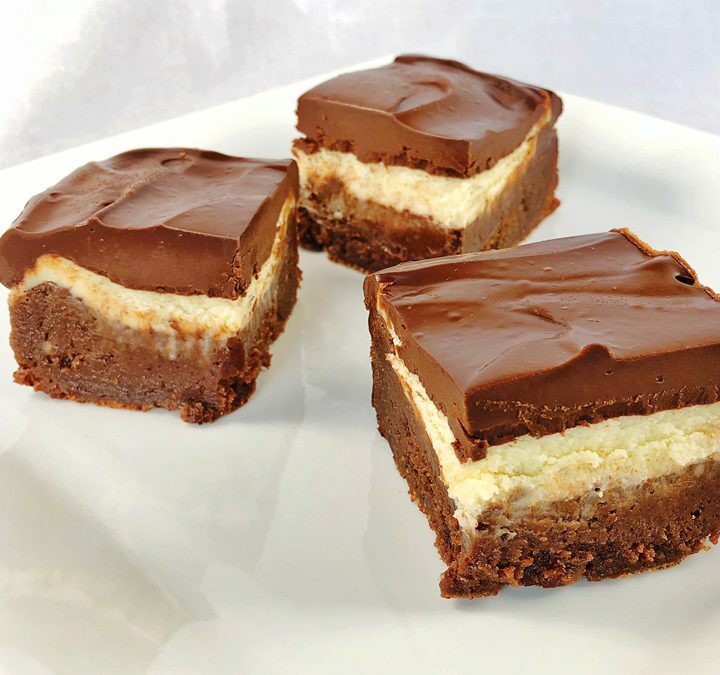 Top the brownie layer with the vanilla cream cheese mixture and smooth the top. Place in the oven and bake on center rack for 40-45 minutes or until the cream cheese is lightly brown around the edges and a cake tester comes out clean. Remove from the oven and cool the brownies to room temperature, then cover with foil and refrigerate overnight. Heat the cream in a saucepan until the mixture begins to steam. Place the chocolate in a bowl. Pour the hot cream over the chocolate. Let sit for 5 minutes then stir until the chocolate is completely melted. Spread evenly over the brownies and refrigerate until set.